Phnom Penh – Apartments in Phnom Penh. Maps of Phnom Penh, Photos and Reviews for each Apartment in Phnom Penh. 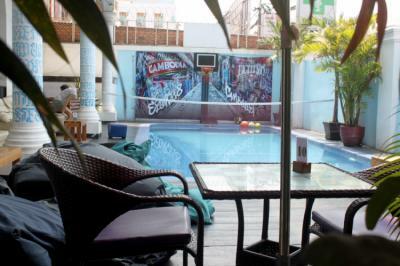 Looking for a hostel in Phnom Penh? Look no further, all the good deals in Phnom Penh are on Dorms.com. Like thousands of other people every month, book your hostel securely at the best price in all neighbourhoods of Phnom Penh. On this site, you can easily find a hostel downtown, in a trendy neighbourhood; a hostel in the student- university district, close to bus or train stations, airports or major attractions of Phnom Penh. We are located in a traditional Khmer neighbourhood so you get a real insight into what life in Phnom Penh is all about. Other areas of the city are becoming very Westernised. We are surrounded by local resturants, shops and a local market. We are also a 5 min walk from Wat Phnom, the traditional center of the city and a sight that is well worth visiting on your time in Phnom Penh. We’ve got a variety of rooms to choose from - our dorms have oversized single mattresses, A/C and individual bag lockers, while our ensuite privates are clean and comfortable with all of the necessary amenities. Our restaurant serves delicious Asian & Western meals, prepared to international standards. clean and spacious rooms. food and drink little pricey but good (can't beat the drink and walk to your bed agenda). people were friendly and helpful. Lovely pool. overall, a good experience. We enjoyed the pool and the bar so much! Hostel is clean, and the staff were very friendly and helpful. easy check in/out. Great food. Close to terminals. Enjoyed our stay!! It was very clean. The location was pretty good. We saw the city by foot. A lot of backpackers. Friendly atmosphere. Cool bar! good atmosphere, free beers in the bar.